I know it's technically not Saturday anymore but I've not gone to bed yet so this still counts! 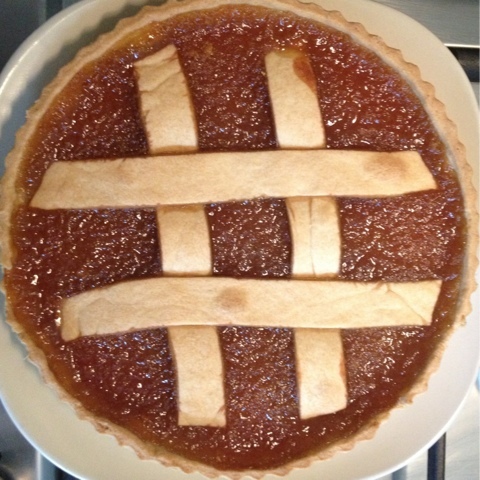 I'm not a huge fan of treacle tart (I find it a bit too sweet and for me that's saying something!) but Mr Hatter likes it so we've managed to find a recipe that satisfies both of us. Also, treacle tart is pretty much vegan anyway - you just need to replace the butter in the pastry. 1. Put the flour and margarine into a mixing bowl and rub in until the mixture resembles fine breadcrumbs. 2. Mix in water with a knife by the tablespoon until a dough starts to form. Gather together gently into a smooth dough. 3. Roll out the dough and use it to line a 23cm (8in) loose-bottomed tart tin. Prick the base all over with a fork and leave to rest in the fridge for 30 min. If you have any spare pastry you can use this to make a lattice for the top of the tart. 4. Preheat the oven to 190C/375F/Gas 5. Line the pastry with foil and fill with baking beans. Bake blind for 10 min, remove the foil and beans (carefully!) and put the pastry back in the oven for a few more min to brown. 6. Mix the filling ingredients together in a bowl and tip into the pastry case. Top with lattice strips if desired. Put back in the oven for another 30 min. Serve warm or cold but make sure you let it cool down enough not to burn you! OMFG I adore treacle tart. Haven't had it in years though. This looks delicious.